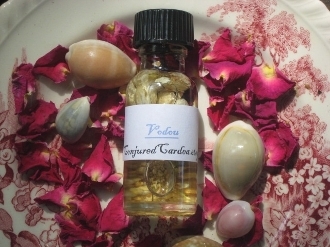 This oil was inspired by the Vodou rituals of New Orleans. When a Vodoun prepares an oil for the client, it is done so with divine guidance, communication and honor. Thought, concentration, communication and ashe' go into the oil and a trance-like state is achieved. While making my oils, I am able to speak to my assistant with my physical mind but serve as a medium and tune-in to my client's needs. Hence the term "two-headed woman" which refers to women conjure folk. We work with a hand in each realm. This oil encompasses the humming drums of ritual, the rythym of our dances, the breath of mystery and the blending of both realms. As a true conjure worker lives in both. Created with honeysuckle, jasmine, musk, vanilla and more.